This Taxco treasure is comprised of 5 panels that showcase a wonderful blend of honey brown amber stones and an elaborate silver beaded/scroll pattern – stunning!! 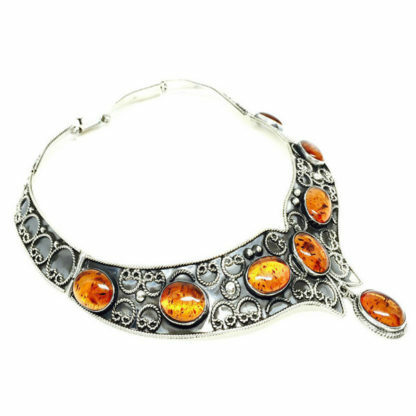 The large central panel of this 79 gram necklace measures 1 1/2″ wide at its widest point, and each amber stone measures approximately 5/8″ long x 1/2″ wide. The measurement from the top of the central panel all the way down to the hanging stone measures 2 1/4″, and it offers a wearable length of approximately 14″ – artistic excellence!! The smallest panels each measure 1 1/2″ long x 3/8″ wide, while the medium panels measure 2″ long x 5/8″ wide at their widest point — the silver work has been punctuated by an uneven niello darkened silver finish – please note that the uneven finish is intentional, and part of the rustic look of this piece – authentic and exceptional Taxco artisan work!! This necklace is easily secured with a tongue and box closure, and it is hallmarked “Mexico 925”.